Days of Our Lives (DOOL) spoilers for Thursday, November 2, tease that Marlena (Deidre Hall) and John (Drake Hogestyn) will join Sami (Alison Sweeney) back at the Elvis (John Enos) impersonator’s house. As they continue their search for Will (Chandler Massey), it looks like there’ll be a break in the case. Sami will try to make sense of a bedroom that seems to belong to someone named EJ. Marlena, John and Sami will finally make a shocking connection. They’ll realize there’s one thing that links EJ, Elvis and Memphis. Days spoilers say they’ll figure out that Susan Banks (Eileen Davidson) must be involved. Just as they put it all together, Susan herself will burst in with a shotgun. DOOL viewers won’t want to miss this fun faceoff. Elsewhere, Lucas (Bryan Dattilo) will get an explanation from Adrienne (Judi Evans). He wouldn’t listen to Justin (Wally Kurth) and Adrienne couldn’t catch up with him before she left for Memphis. Days of Our Lives spoilers say Lucas will get confirmation on the doppelganger swap. He’ll try to wrap his head around the news, but don’t expect Lucas and Adrienne to last as a couple. In the meantime, Eve (Kassie DePaiva) will get settled in Salem. She’ll find a more permanent living situation, but she’ll soon become preoccupied. Days spoilers say Eve will get updates on Ben’s (Robert Scott Wilson) latest claims. She’ll determine that if Will’s alive, Paige (True O’Brien) might be as well. Unfortunately, Eve will just end up disappointed. Susan was only interested in bringing Will back to life, so Paige and Serena (Melissa Archer) are still dead as doornails. Eve will have to cope with her grief again and find a way to move on. 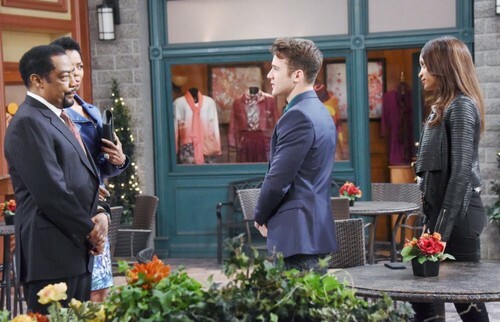 She’ll throw herself into some Kiriakis drama as she takes a few risks. Across town, Lani (Sal Stowers) and JJ (Casey Moss) will struggle through a difficult lunch. They’ll meet up with Abe (James Reynolds) and Valerie (Vanessa Williams), but the meal will come with some tension. Abe isn’t a big fan of Lani’s boyfriend and things are about to get much worse. Days of Our Lives spoilers state that JJ will face Abe’s wrath in the weeks ahead. It sounds like these storylines are heating up. We’ll keep you posted as other DOOL details emerge. Stay tuned to the NBC soap and don’t forget to check CDL often for the latest Days of Our Lives spoilers, updates and news.